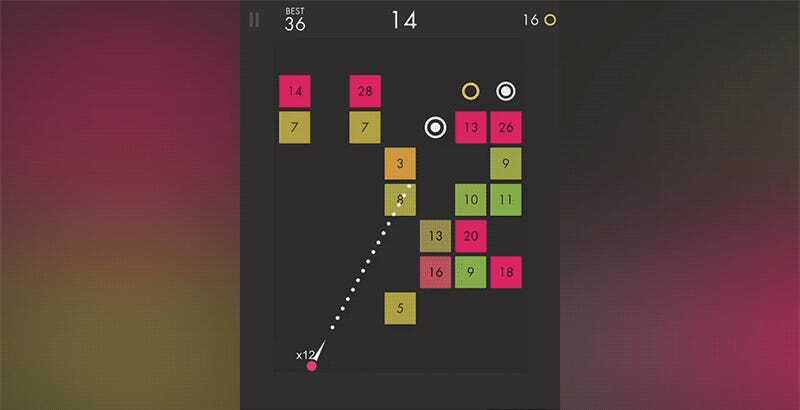 One of the hottest new mobile games going is a clever take on the brick-busting genre called Ballz. Go ahead, get it out of your system. I still haven’t. Available as a free download on iTunes and Google Play from the folks at Ketchapp, Ballz is one of those quick and dirty (shush) games that’s easy to pick up and difficulty to put down. Players fire their balls into the air in order to take out blocks before they reach the bottom of the screen. Each block has a number, indicating the number of hits it needs to take before disappearing. As the game progresses the numbers get higher, but the player also collects extra balls as they go, increasing their circular army to better deal with bigger digits. Here is a video of me playing Ballz. Dammit. The game is free to play, with a one-time $1.99 ad removal option available. You’ll want to take advantage of that offer before you get too deep into Ballz. Okay, that one was on purpose. When I first saw Ballz on the iTunes charts I wasn’t sure if it was there because it’s a killer game or because it’s got a smirk-worthy name. Now that I’ve spent some time with it, I’d say it’s a little column A and a little column B.